The Melitta-E953-102 Caffeo Milk and Solo is a solid bean-to-cup coffee machine. It's simple to use and can produce excellent espresso despite its compact design. It also comes with a milk frothing wand, although this takes some practice to use correctly. 3.1 Does the Solo and Milk come with attachments for milk frothing? 3.2 What colours is the Solo and Milk available in? 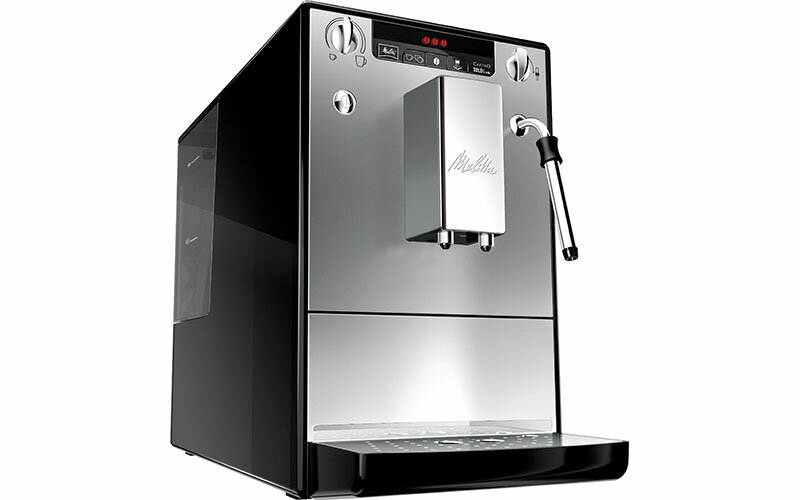 The Melitta E953-102 Caffeo Solo & Milk is a fully automatic coffee machine with a compact design and two-cup output. It’s a “true” bean-to-cup model, allowing you to produce fresh coffee from beans without worrying about grinding, tamping or measuring. There’s also a steam wand for frothing milk for lattes and cappuccinos. But how does the espresso taste? Is it straightforward to use and clean? And does the Caffeo provide the same quality and durability as other machines in its price bracket? Keep reading our Melitta Caffeo Solo & Milk review to find out! 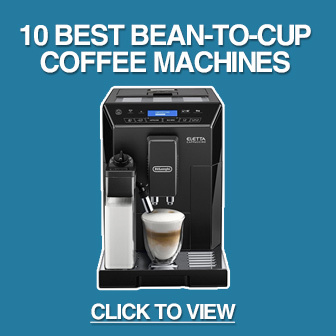 You can also view all our bean-to-cup coffee machine reviews. With dimensions of 20 x 32.5 x 45.5 cm (WxHxD), the Caffeo Solo & Milk can reasonably claim to be a compact bean-to-cup coffee machine. It’s also an attractive appliance, with a simple silver colour scheme and professional-style appearance. This certainly isn’t a machine that’s going to ruin your kitchen’s decor. The control panel is easy to use. There are two dials – one for drink amount and the other for the steam arm – along with a straightforward LED display. While the model might lack the advanced features of more expensive machines, its simplicity is an advantage if you just want to quickly make fresh coffee. 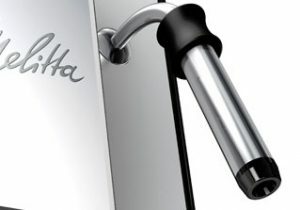 This review is of the Melitta E953-102 Solo & Milk, which is the silver model. There is also a black version with the product code E953-101. Both machines have the same features other than a different colour scheme. On the inside, the Caffeo has a 1.2 litre capacity. This is enough for roughly 10 cups of espresso before needing to be refilled. It brews using a 15 bar pump, which is standard for a bean-to-cup machine, and everything is fully automatic. That means you don’t need to worry about tamping or grinding – just add water and beans, choose your settings and press start. The Caffeo comes with a pre-brewing function. This pours water over the coffee before the actual brewing process, causing extra taste to be released and maximising flavour. As you can tell from the photos, the E953-102 has two spouts. This allows you to brew two cups of coffee at the same time. 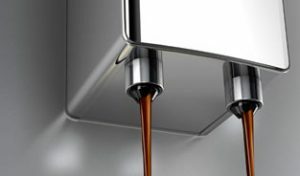 If you and your partner enjoy drinking coffee together, a two spout machine is essential – otherwise the first cup is likely to go cold while brewing the second. Like most bean-to-cup coffee machines, the stainless steel grinder has settings for grind coarseness. In this case, however, there are only three options, which is less than other machines. The Caffeo includes automatic quality control for grinding though, which should improve the consistency of your coffee (at least in theory). There are several settings for adjusting the espresso to your personal tastes. Three strength options are included, and there’s also the option of adjusting the temperature of the coffee. We like that there there’s a dial for adjusting the drink quantity. This gives you greater control over the output, ranging from 30ml to 220ml, instead of just choosing between two or three presets. 220ml is also enough for a “real” coffee – so you’re not stuck with small espresso cups. A downside is there isn’t the option to use ground coffee instead of beans. This might not sound like a drawback for a bean-to-cup coffee machine, but means you can’t use decaf or try different blends. It might take a few tries to produce espresso to match your taste, but the Caffeo Solo is capable of producing excellent coffee. In fact, people have compared the quality of the espresso to coffee from cafes. The Caffeo Solo and Milk comes with a manual milk frothing nozzle that’s controlled via a simple dial. This allows you to produce warm and frothy milk for cappuccino or latte. Like all manual nozzles, this takes some practice to get right as there isn’t an automatic frothing mode, but allows you to produce a wider range of drinks than an espresso-only machine. However, it’s never going to match the consistency of an automatic cappuccino maker. There are also reports that the end result is often too watered down once properly frothed. Even so, the Caffeo is capable of producing a tasty cappuccino or latte once you get the hang of it. The machine can also produce Americano. If you’ve ever bought an appliance that’s difficult to clean, you know how quickly this can sap the enjoyment out of using it. This is especially true with coffee machines – they are likely to quickly become unused if the cleaning process is long and complicated. Fortunately, the Melitta Caffeo and Solo is a relatively simple machine, so it doesn’t require too much maintenance. Like most bean-to-cup models, there are several cleaning programmes. The first is a simple automatic cleaning option. There’s also an automatic descaling programme that should be run every few months. This programme makes removing limescale easy, but you’ll need to follow the instructions closely as the process can be quite involved. The brewing chamber can be removed for cleaning. Melitta recommends just rinsing this under a tap and wiping with a damp cloth. The drip tray is also easy to remove for rinsing. Energy efficiency is easy to overlook when buying a bean-to-cup coffee machine – but it can have a big effect on the long-term cost (especially if you’re a heavy coffee drinker!) At peak power, the machine uses 1400W, which is considerably more than the average microwave. Fortunately, it doesn’t use this amount of power for long periods. The E953-102 also comes with a 0-Watt switch, which effectively disconnects the machine without having to unplug it from the mains. An added bonus is that settings are still stored when using this button. You can also program the coffee machine to switch off or on at a set time to save energy. The two spouts are height adjustable. The maximum height is 135mm, making the machine suitable for high latte glasses. It comes with a “Companion App” – although this is really just a gimmick. The app includes some tips for enjoying your espresso, displays the status of the machine and shows instructions for how to use various functions. The app isn’t able to change settings though, so you’re not likely to use it often. There is the option to add a water filter to the Caffeo Solo and Milk. A single filter is included with the machine, but you’ll need to buy additional filters separately. If you’re not sure what you need, check out this post on water composition. A passive cup warmer is included. This is great for heating your cup before brewing. The water tank has a sensor for water quantity, so it won’t switch on when it’s empty (which could damage the coffee machine). An energy saving mode is included to reduce power consumption further. With an RRP that’s at the lower end of our “Mid-Range” price bracket, we think the Melitta E953-102 Solo and Milk provides great value for money. It’s simple to use, has a milk frothing arm and, most importantly, produces excellent espresso. While it doesn’t have an automatic milk frothing function, we wouldn’t expect it from a model in this price range. Does the Solo and Milk come with attachments for milk frothing? Aside from the manual steam arm, the model doesn’t include any other attachments for milk. If you want more attachments for milk, the company’s Perfect Milk coffee machine may be the better choice. This includes an integrated cappuccino maker. What colours is the Solo and Milk available in? There are two colours available: silver (E953-102) and black (E953-101.) Both options have identical features – the only difference is the colour scheme. The Melitta Melitta E953-102 Caffeo Solo and Milk is a compact model that won’t take up too much room in the kitchen. It’s also capable of automatically producing excellent espresso from beans, while providing a variety of options for coffee strength, temperature and quantity. The steam milk frothing arm also allows you to make lattes and cappuccinos. There are a few drawbacks though. It doesn’t have the option of using pre-ground coffee, so you can’t use the machine to make decaf. The descaling programme is also quite involved, although you’ll only need to run it every few months. Despite these minor problems, the Caffeo Solo and Milk is an excellent bean-to-cup coffee machine that provides great value. If you’re looking for a 2-cup model that’s relatively small, easy to use and can produce tasty espresso without spending too much money, it’s definitely an option to consider.